Grind spelt berries in a blender until coarse. Sprinkle with salt. Soak over night in warm water. 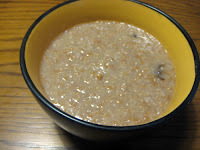 Cook spelt in 2 c. water, cinnamon and prunes. Simmer until creamy, 35-45 minutes (spelt flakes 10-15 minutes). Serve with honey and/or other topper. Espero que ahora ves bien la receta. Muchas gracis por avisar. The recipe is now visible thanks to Mila's comment!